A new report maps the landscape of New York state nutrition education policies and programs as the Trump administration and Congress de-prioritize public health initiatives. The Trump administration’s plans to cut the federal budget, coupled with the tax law that Republicans passed at the end of 2017, will create dramatic changes in the daily lives of many Americans. In public health alone, the tax law is likely to trigger massive spending cuts, including $61 million from the Centers for Disease Control (CDC) and $900 million from a health education fund in the Affordable Care Act. The tax bill could also mean $145 million in cuts to the federal food stamp program, known as Supplemental Nutrition Assistance Program (SNAP), which includes SNAP-Ed, a program that provides tens of millions of dollars to states to fund initiatives that promote healthy eating habits and prevent obesity, like cooking demonstrations at farmers’ markets. Policymakers and advocates seeking alternatives to fund these types of programs are further stymied by how the federal funds even flow to local and state-level programs. Charting the ways that federal policy affects these nutrition education programs at the state and city level is about to get a bit easier: A report released today by researchers at the Laurie M. Tisch Center for Food, Education, and Policy at Columbia University’s Teachers College, attempts to map out those connections, using New York as its focus. The report, “Empowered Eaters,” is the first detailed look at the complex landscape of nutrition education policies and programs in the state. Uno and her team define nutrition education broadly. “It’s helping people gain the skills, attitudes, and knowledge to make healthy decisions as well as supportive environments, policies, and systems that can facilitate those choices,” she explained. A lesson on reading nutrition labels counts, so does a cooking class, installing a community garden, and much more. The timeliest finding was how dependent local programs are on federal funding, which makes them vulnerable to shifting political priorities. According to the report, of the 32 nutrition education initiatives administered by New York state during fiscal 2016, 28 were fully or partially federally funded. Federal dollars also accounted for $1.19 billion of the $1.76 billion New York spent on public health initiatives in FY 2015. The researchers also found that many of the existing policies would be more effective if they were more responsive to individual community needs, and that there’s a lack of coordination between agencies working on these issues, including the U.S. Department of Agriculture (USDA), which oversees nutrition education programs like SNAP-Ed, and the CDC, which oversees programs like the Racial and Ethnic Approaches to Community Health (REACH) program. The report comes at time when the government has prioritized cutting social programs of all kinds and are de-emphasizing support for policies that focus on goals like curbing obesity rates. The attempts to repeal and gut the Affordable Care Act could also have major consequences since many state nutrition education programs are funded through the law’s Prevention and Public Health Fund (PPHF). Advocates and educators have taken these developments as a wake-up call, especially given the coincidental timing of the report and its findings related to how dependent nutrition education programs are on the federal government. The big question now is how to keep funding flowing to these programs. Uno and McCarthy said that they plan on publishing a guide to their methods so that other states can follow their lead and create their own roadmaps of the nutrition education landscape. If they did so, many themes would likely align, since money from programs like SNAP-Ed and PPHF go to every state. The researchers also hope that showing how funding is used will encourage lawmakers, leaders, and advocates to commit to building a more effective, well-funded nutrition education policy that actively supports improving health outcomes for all Americans. “A lot of it comes down to where money ends up. Is it actually making it to the communities?” Uno said. An example of where that money flows is Bronx Health REACH’s programs, which have focused on reducing minority health disparities in the borough since 1999. 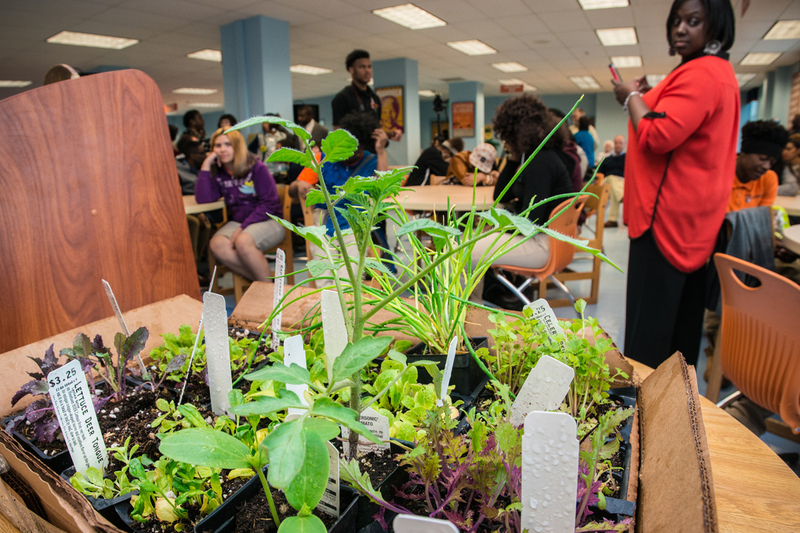 The organization has worked to get produce and healthier snacks on shelves at local bodegas; its FoodCorps service members have installed teaching gardens, organized parent and student tastings of an alternative lunch menu, and regularly lead classroom lessons on food and health. That work could be seriously curtailed soon, since a significant portion of the organization’s budget is funded through REACH, one of the CDC programs slated to be cut later this year. Top photo: A sample of the plants that have been planted at the new Frederick Douglass High School community garden in April 2016. Photo by Lance Cheung, USDA. The tax bill was exempted from PAYGO as part of the Continuing Resolution signed by the President in December. This means that the automatic spending cuts cited in the first two paragraphs are no longer a threat, at least as a result of the tax bill being passed. Many of the programs you identified could be cut in either future budget negotiations or in the next Farm Bill, including under the rationale that they are needed to reduce a deficit that was increased by the tax bill, but automatic PAYGO cuts directly resulting from its passage are no longer on the table.